If you want to fix your Galaxy S6 Battery Drain Issue then follow these simplest solutions, and easy to improve your Samsung S6 battery life. Usually, these problems start, and they can occur in any Samsung Galaxy and not only my Galaxy S6 as I have come to understand. And this type of issues can happen, so we have got some best solution about the Galaxy S6 Battery Draining, it can be applied to other devices as well, and I also included several other possible fixes. Here we are beginning with several issues to check out after going with other solutions, so first we have to know that which apps or services are taking the larger chunk away from your battery. You can check that in the settings where there is an option to see which app or service is draining your battery fast. You can also download the GSam Battery Monitor app from HERE which have to get the full report about likes gaining the amount of battery eaten out by the apps, system, most important part and more. Turn off those apps which are used more battery even when they are not at work. Samsung Galaxy S6 and Galaxy S6 Edge as an exclusive feature called Briefing. It lets you do everything at one place by curetting all the info from many sources. This may boom user-friendly but actually, it is a pain using it, and also it affects your battery life a lot. So better we turn off this feature and increase the battery life. This is how you can turn-off Briefing. Swipe over to the left which will get you to Briefing. This is a hidden feature of Samsung Galaxy S6 and S6 Edge which you would not have set up it ever if you have not read this article. Follow the following steps to turn off the unknown reports from Google because it eats up your battery. Here you will get the “Google Text to Speech Options,” tap on it and turn off the anonymous reports option. We have routine steps to habit and a bad one too that we keep all ON. It is not necessary to maintain features on even when you are not in need of it. Things like the Mobile net, Bluetooth, Wi-Fi, GPS, NFC, Location Services, etc. If you are not in need of any of these services at a difficult time then just turn it off. This will only increase your battery life. Although important to stipulate that so many features it will only injury the battery life of its gadget Samsung keeps on count them. But at the similar time, it has also given us two ways to save the battery, and these ideas might help to drain the battery at least in Samsung Galaxy S6 and S6 Edge. When you tap on Battery check, you will see two modes. One is the “Power Saving Mode, ” and the other is “Ultra Power Saving Mode” choose one which greatest suits you and that will help you to save some battery life. Allocation your mobile connection from your Galaxy S6 and S6 Edge with your friends via the new Wi-Fi sharing feature sound kind of cold but believe me, it drains your battery to the fullest. So it is sensible to share your Wi-Fi sharing feature only when your friend or someone else is really in need of some data use, else just don’t do it for charity. More you reduce tethering more the battery will survive. More the superior phone like Galaxy S6 or S6 Edge is more it takes up the background data, and that is a universal truth. Yes, the history data help your phone to boost the performance and your user experience, but it drains abundance from your battery life. If that is the case then why not disabling your background data when you think your phone will stay idle for a while? Just follow this path and put out of action your background data and feel happy. Go to Settings → Data Usage → Background Data. 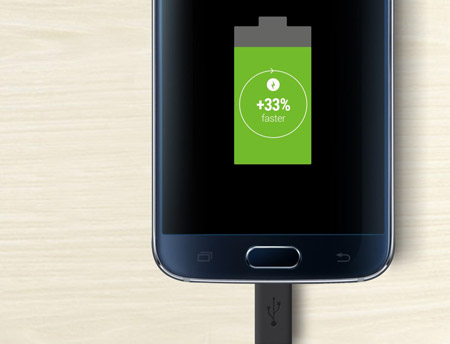 Now turn off the option, and you will get less battery consumption on your Galaxy S6 and S6 Edge. 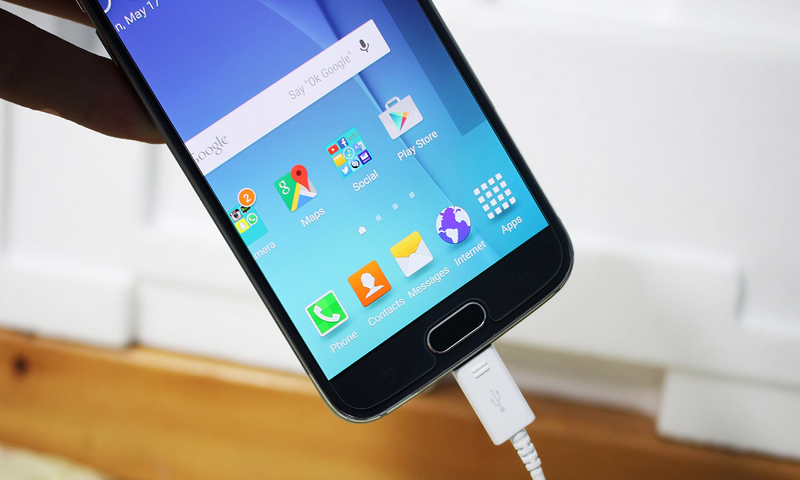 Just like any other Android Smartphone Galaxy S6 and S6 Edge too needs a full charge phase every month. This means to charge your battery to the full, i.e., 100% and then using it altogether or in other words to 0% and then charging it again to 100%. This will make sure that you get correct battery usage and it will maintain your battery well too. You may not discover the dark wallpaper in the default wallpapers provided by Samsung but it is always good to have black wallpaper, and that will save a bit of your battery life as well. Better to make your black wallpaper and save it to your gallery and then use it. You can also disable some of the notifications of certain apps. Always ringing and flashing notifications will also eat out the battery. So just stop those unwanted notifications at once. Before using this choice as the last option just switch off and turn on your Galaxy S6 or S6 Edge once as sometimes the restarting of the device can also solve the problem. But even that is not enough or neither of the above solutions is working then Factory Reset is the final option. DO NOT FORGET TO TAKE BACKUP before you resort to the Factory Reset option or you may also follow this path to do the factory reset along with backing up the data. So, these were the best feasible solutions for your fast draining battery on your Samsung Galaxy S6 and S6 Edge.